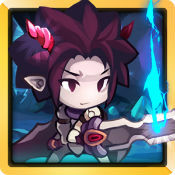 God of Attack v2.1.0 Mod apk for Android. If its asking for sync? Then you are banned. Thats my theory anyway. Its that way in other games. Maybe try another device. Dont save the game to your device. All you have to do is clear the data and start over if you run into sync again. Dont use auto. There is no way to turn it off. Hours in auto will get you banned. Dont level or buy stuff that your current gold, diamonds or honor dont match. Dont go crazy with buying up stuff.